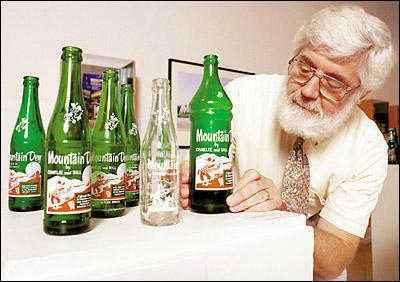 According to Wikipedia, in 1940 two Tennessee beverage bottlers named Barney and Ally Hartman invented the formula for Mountain Dew. I walked into the 7-11 and quickly made my way to the back of the store where the drink coolers are located. Immediately, I could see it staring back at me. The 12-ounce, green canned goddess looking into my eyes. I couldn’t resist, I grabbed it and jumped to the cashier and butted in front of an old lady with blue hair and a walker. I couldn’t wait. Beads of sweat began trickling down my forehead towards my nose. The cashier looked at me like I was a crack or meth head looking for my next hit. Well, she wasn’t that far off. Much like meth addiction, if I continue my assault on these green canned goddesses, my teeth are sure to start dropping out of my mouth indiscriminately. She scanned the bar-code, “that will be $1.06 please,” she said as she annoyingly chewed her gum and twirled her poorly bleached blond hair. I reached deep into my pocket and pulled out a wide array of change and dumped it on the counter. I couldn’t count it quick enough. I had no patience, I just shoved it towards the cashier and ran towards the exit. I didn’t even wait for her to put it into a little brown bag. I had no idea how much or how little I gave her, but I didn’t care. As I opened the door to leave, I heard the cashier call me a jerk-off, but those were just words. I had the goddess in my hands. I had what I came for. I sat down with my back resting on the side wall of the 7-11 where no one could see me. I teased the tab and pulled it open. The sound of carbonation jumped into the air and a drop of the citrusy goodness splashed against my cheek as if to tease me back. I raised the opening close to my lips, under my nose and breathed in as hard as I could. Oh, the fruity, sweet smell was intoxicating, like riding on a unicorn floating above soft, white clouds without a care in the world. The elegant dance of can versus man was over. I turned the can up into the air and let the gooey sweetness flow rapidly down my throat. Suddenly, I was transported into a different world, a different land where time and space did not matter. I saw visions of flowing streams, gently trickling through dense mountain forests. Mermaids were swimming peacefully, touching each other gently in naughty places while baby birds chirped on branches above their heads. Then, the last drop fell onto my tongue. I opened my eyes and realized I was back in the real world. The dream-scape was over, the mermaids were gone and the birds were now silent. I would soon be searching the streets for loose change to scrape up enough money for my next hit. Hello Mountain Dew, I love you and I hate you at the same time. I am an addict and I can’t stop. Had there only been a warning sign on your green can, kind of like cigarette warnings, maybe I would never have tried you. Maybe I would have drank you down anyway. Maybe I will find one of those ambulance chasers and sue PepsiCo for turning me into an addict when I weigh 400 pounds and can’t get out my front door or when diabetes take my feet. Maybe I will just continue to drink you down anyway. Thank you Barney and Ally Hartman. You are my heroes, you are my inspirations. Chris DeVoss might share the number of his 12-step detox place where he kicked Candy Crush. Luckily, you and I are not competing for the Dew. It’s all yours. Just keep your mitts off my Coors Light. There’s levels in the 400’s and 600’s that will do that too. Not that I’d know. Someone told me. Mountain Dew hurts my teeth. Great post. Yahoo! That’s what we use to do when ever we had a Mountain Dew when we were kids. We would run through the neighbourhood screaming Yahoo! Mountain Dew! You would swear they actually put cocaine in it like they use to with Coca Cola (Coke). Now that I have aged myself as being born in the stone age… I would like to try one again. I don’t even know if they still sell it in Canada. Bah. 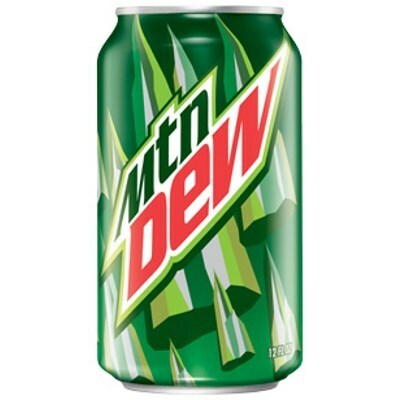 I only drink Mountain Dew, not “MTN Dew” whatever the heck that is. I’ve gone 2 days without a Dew. Let’s just say quitting meth might be easier. I’m sorry to bring you back to the addiction, but I couldn’t help it. Soda is so damn good.